You want to create a feed reader about a service and follow the link attached to every news to see the destination insinde the browser. 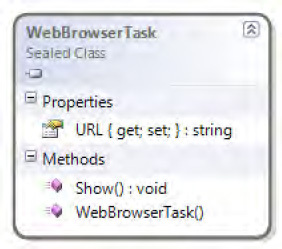 You must use an object of the WebClient class and open the link by using WebBrowserTask. For our application, we chose an Atom feed made available by the British Broadcasting Corporation (BBC), but it's clear that you can use all feeds in Atom format. Now that you have prepared the containers for your data, it's time to retrieve them from the cloud by using the WebClient class. The Click event of all HyperlinkButton controls created by the ItemTemplate will be handled by the HyperlinkButton_Click event handler, which will do the true work. This declares at the class level your WebBrowserTask object, which will enable you to launch the web browser application. As you can see in figure 1 the two most important members of this class are the URL property and the Show method. URL represents the target address, while Show shows the browser . There is a problem in WebBrowserTask that sometimes doesn't open the site; we have noticed this problem only when the device is connected to Zune. From Visual Studio 2010, press Ctrl +F5. The type of target is not important, as this recipe can work as fine on the emulator as on the device. The application will start, briefly showing the splash screen and then the main page. After a few seconds (depending on your Internet connection), a list of news items will display. Click the hyperlink button to access the Browse function and open the link relative to the news.